Firstly, video summary on the math stagnations in 90-95% of all USA states around 2005-2009 according to NAEP math data. To give the overall perspective, I will share here the NAEP 2015 math data of the grades 4 and 8. 8th grade math: NAEP – 2015 Mathematics & Reading Assessments for the 8th grade. You will see that regardless of the grades 4 or 8 math, the top math state – bottom math state (except Puerto Rico) difference of the below basic share is of ~ 12-13% and that of the math proficiency share ~ 26-30% more or less. Please remember that the MMU1 operation magnitude is to boost ~ 50 percentile (e.g. from about 25 percentile to about 75 percentile.) Even the MMU 0.5 ~ 25% boost, at least 2/3 larger than the gap between the math proficiency top state vs. that of the mid-lower end math USA states (or their math lower half districts). Math stagnations that almost all of the USA’s DoE superintendents don’t seem to be keenly aware of. 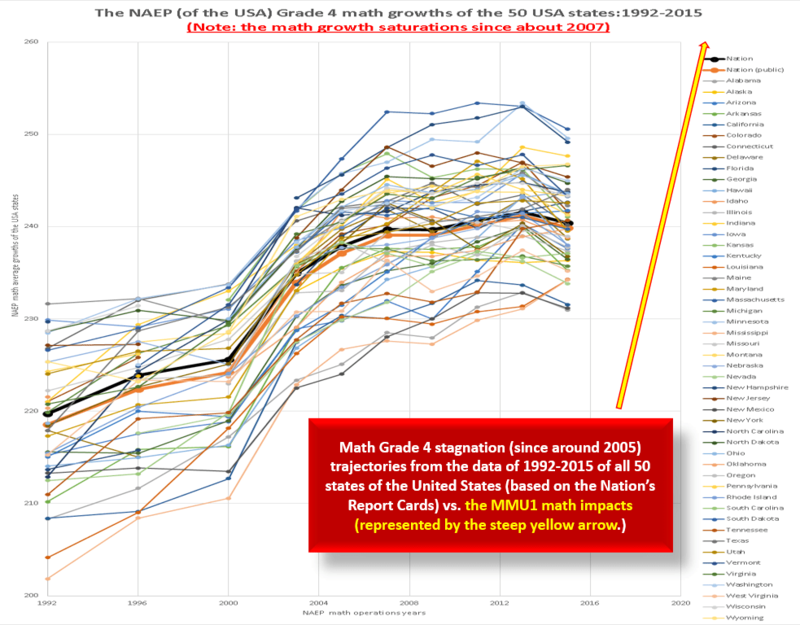 The math growth years of most USA states ended almost a decade ago. And NAEP is one of the confirmation, let alone math results from the PISA and TIMSS past 15-20 years. For the grade 4, you can click to see the visual data with your own eyes. NAEP – 2015 Mathematics & Reading Assessments. Between 2005-2015, except several states although between 1992-2005 had big math growths of most of the USA states for the math grade 4 according to the Nation’s Report Card. What do all these mean? In spite of tens of billions of USD pumped in over a decade per state average in the USA, the party and champagne time is over. After the 2015 dip, the Common Core math was the major culprit, but in my analysis the dip is relatively minor. What is really happening in 90-95% of all USA states based on the current DoE operations and charters is the almost decade-old math stagnations nationwide. If you would like to investigate my research conclusions about the math stagnations as a international, national, and 90-95% of state phenomena, you can explore at WP Series repository of “Math Stagnation Nations” series. In conclusion, the overall historic math patterns of the most respected and long-running math assessments show that the traditional math EDU has reached its limit and it is not just DE or the USA. And the huge innovations are needed and I mentioned to you as to why the super stars of math education are absolutely necessary because neither districts, nor charter movements, nor the stars of the CMOs (Charter networks) can really advance the math proficiency much next 10-20-30 years or more. The normal level collaboration levels of school principals or math teachers will not and cannot bring the radical changes, be it most charters or districts for the tens of thousands of the math poor students or even hundreds of thousands of them. That is why I pursue 100% online operations to shake up everyone and wake them up with the concrete data instead of muddling down the MMU series potentials with the lukewarm boring results. Now is already mid-March. So I hope that I can run some operations of MMU1 pilot studies in some USA districts or even better if the state DoE level commitment to make things move forward faster. Most of the big city districts in the USA have enough internet access and the computer or tablet access to run the pilots for 1-2 weeks in April because late May is basically end of the academic year and districts will be too busy for the final exams. As the Common Core tests have been going on, I think the technically to operate in 1-2 larger size districts together will not be of too much of hassles because on the math themes that we agree upon, I will literally uplift the math poorest half average of the participating district(s) to the math best half average. Even if I bring half of my goal (in the worst of the worst case scenario) by lifting the math 35 percentile to 60 percentile in 1-2 weeks of MMU pilot studies, still this is almost on par with the math proficiency difference between the best state of the USA and the bottom state like Alabama (depending on the below basic or proficiency levels). So I think this proposal has tremendous potential excite everyone although again this may make some math teachers nervous although they have no reason to be nervous. Anyway, please meditate on this and try to explore what we can do and how we may be able to achieve with the minimum hassles … preferably in April. What data and evidences justify the claims of the MMU variations? You can start from the links here.